In a northern suburb of the City of Light, the Basilica of St Denis is a stone abbey dating back to the medieval time period. Construction began as early as 1135, so it’s a remarkable landmark to see still standing today. The cathedral was the first built in France in the Gothic architectural style, noted for its intricate stained glass and a statue collection representative of the era. It is attributed with signaling the shift from Romantic to Gothic styles of architecture. Though it is one of the lesser known churches of France, it is respected both for its beauty and historical and cultural significance. The church is also the final resting place for much of France’s royalty. A walk past the burial chambers and tombs of kings and queens of France tells centuries of the country’s history. Long a place of pilgrimage, all but three of France’s monarchs from the 10th to 18th century were buried there. With all of its history, many opt to take a guided tour through the church or add it on to a day of sightseeing in Paris. The basilica is located in the Saint Denis suburb of Paris, best approached by metro line 13 (the station is Basilique de Saint-Denis.) The travel time is about 20 minutes. Tickets cost 9€ and can be purchased in person or in advance online. The area dedicated to worship is free to enter. Visit the final resting place of dozens of French kings and queens at the remarkable Basilica of St. Denis. Ride the Metro with a guide and small group to reach the 13th-century masterpiece, which was one of the world's first Gothic churches. Take a tour through the tumultuous arc of the French monarchy, from medieval rulers to the bloody end of the 'Ancien Régime' with the French Revolution, and learn about the role of royalty in the evolution of Paris as you view an amazing collection of tombs and altars. 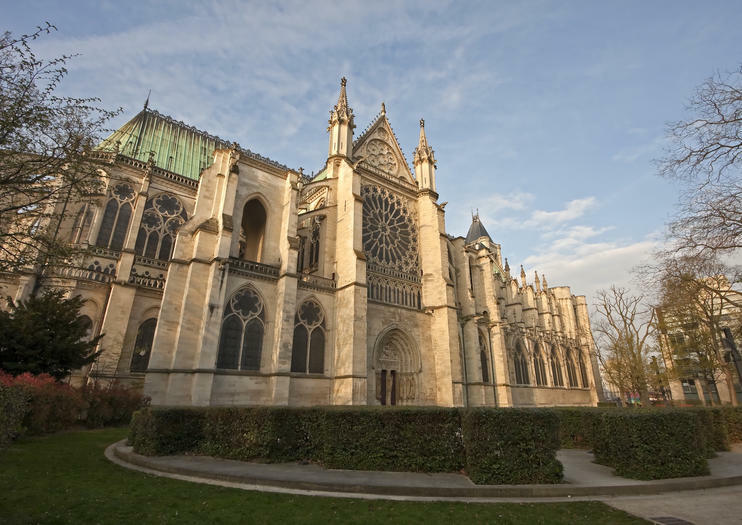 Visit the Basilica Cathedral of Saint-Denis, located just outside of Paris, with a skip-the-line ticket. The final resting place of French kings and queens, the Gothic cathedral was constructed on the tomb of St. Denis, a bishop who died in 250 A.D.